The green zone is my ideal – a strategic role in a team-based, consulting environment, working for mission-driven clients. If you can help me make this happen, you’ll be my hero! Mission-driven is my shorthand for a range of possibilities including both for- and not-for-profit organizations that have a strong sense of purpose beyond making money and contribute positively to their communities. I consider many entrepreneurs and small businesses to be part of this group even without an overt social mission. 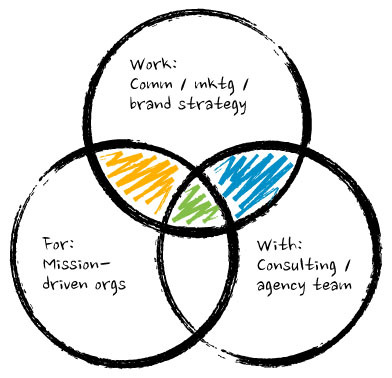 Only a tiny handful of people work completely at the intersection of brand, mission, and team, so while I cultivate that space there are two other intersecting zones I look for. The yellow zone comprises the heart of my work as a brand and communication consultant. The engagements I enjoy most are developing organizational identity, positioning, and narratives from the ground up. In plain terms, that means I help them get clear about what they are and can go, gain new insights into their audiences and markets, and bring it all together in messages that are simple and powerful. (More about what I do.) I always appreciate referrals to leaders in mission-driven organizations who are ready to raise their visibility and impact. While this offers rewarding work for clients I love, direct consulting is often solo. To balance that I also look for opportunities on the other side, in the blue zone. It’s doing the same kind of work, but as a freelancer with existing brand agency teams for more mainstream clients. Working with teams is collaborative and accelerates learning, and these experiences give me renewed inspiration and tools to bring back to my mission-driven clients. If you know of agencies or consulting firms that need freelance help on their projects, introductions would be most welcome. Those are three ways you can help me grow. Please let me know what I can do to help you! Dollar Shave Club and Unilever win big — what about the customers? “Erica is unstintingly thorough and brilliant at getting to the heart of the strategic matter, distilling masses of information into actionable ideas that cover a smart range of options. I loved working with her, and our clients adored her thinking, responsiveness and vivacious self. “Extremely thorough in her research, she left no stone unturned and wasn’t afraid to venture into the unknown. She also expressed key insights in clear, meaningful ways to persuade us to consider alternatives and move the team and the vision forward." “Erica is one of the most knowledgeable and strategic marketers that I have had the pleasure of working with. She has equal ability to see both the big picture and the minutia of every project, and to translate her vision into effective solutions for her clients. “Erica did an amazing job. She came up with some great preliminary concepts and produced a stunning final project. This was a protracted process on our end and she continued to provide quality work throughout. Copyright © Erica Frye. All rights reserved.